News: Version 1.2.0 released 17 January, 2010. A burst of nostalgia for your Mac. Reminisce with me about being a Mac user in the ’80s. Saving the CRT on your precious Plus or trusty IIcx from dreaded burn-in was serious business. Maybe you opted for the simple blank screen; perhaps animated line art was more your style. For me, it was all about the fireworks. 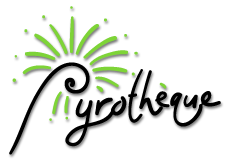 Silent, hypnotic, dependable fireworks. 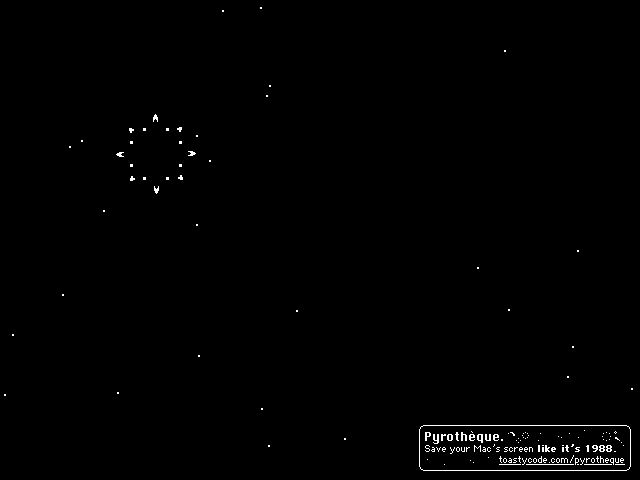 It seemed to be what the Mac did on its days off; tiny pixellated explosions were its hobby. 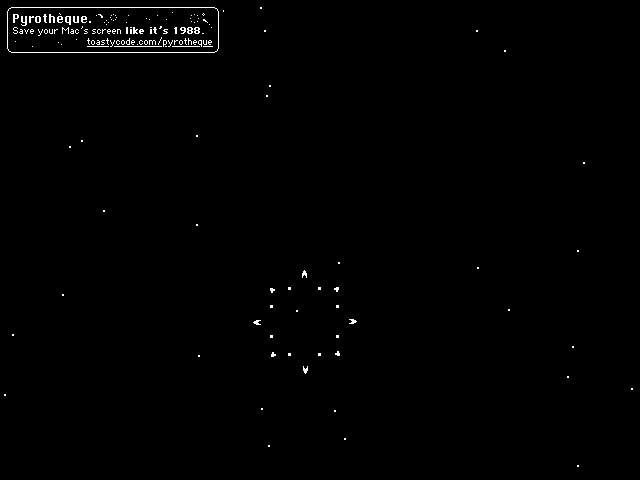 Pyrothèque brings the classic fireworks screen saver back to Mac OS X, lovingly re-created from scratch using only the finest black and white pixels. Or, use the dead-simple control panel to switch from classic mode to modern mode, and let your shiny new Mac show off a little. Download it now using the big buttons above. Pyrothèque costs a measly US$4. Four bucks. The cost of a fancy espresso drink. Or half a movie ticket. Your registration fee supports bug fixes and development of more little OS X gems like this one. Thanks for buying a hungry grad student’s lunch! Further reading: “Pyromania,” the complete story of how Pyrothèque was born, including a carefully-assembled history of Pyro!™, After Dark®, and the other early Mac screen savers. Checkbox to disable the startup screen. Runs (again) on PowerPC Mac OS X 10.3.9. Removed some debug code that was left in v1.1.1. Screensaver code is now signed (for future use by Mac OS X). 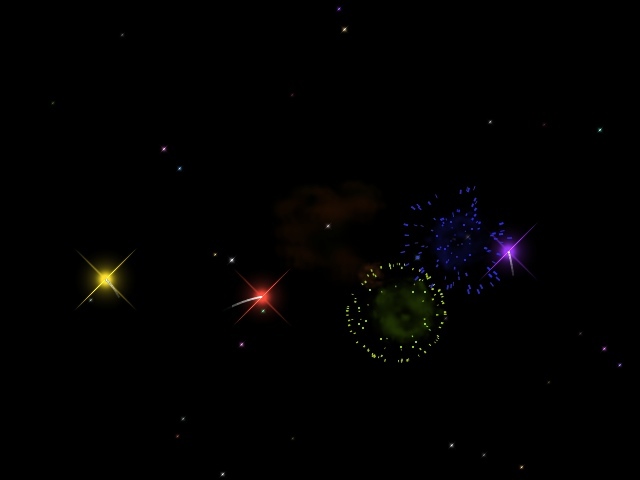 Improved the fireworks targeting code; users with large or portrait displays should now see most explosions on-screen. Other small bug fixes accumulated since the last release. Huge improvements—see the release notes on the toastycode blog. 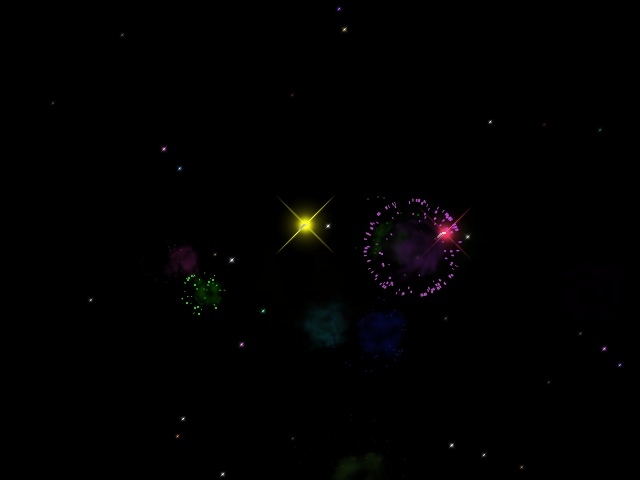 Improved smoke animation (Modern mode); new Stars checkbox (registered users).